I tortured Casey and wasn't even able to get a good picture out of it. Heh. Poor guy. That dinosaur gives Barney a run for his money. So cute! Just realized he's a dragon. Duh, sorry. Aw, so cute! I need to get a costume for Xander this year - because I'm pretty sure I'm running out of time to make one. How adorable. Halloween is about torturing kids and making it up by giving them sweets. Very cute! I used to do the same to my oldest daughter...dress her up in her costume or Christmas dress just to take a picture....She doesn't cooperate with that anymore- darn those 19 year olds! @ keely: old navy's usually go half price the week before halloween! @ suzie: yup, love me some ON! @ erin: and he LOVES HIS CHOCOLATE! lol. How cute. 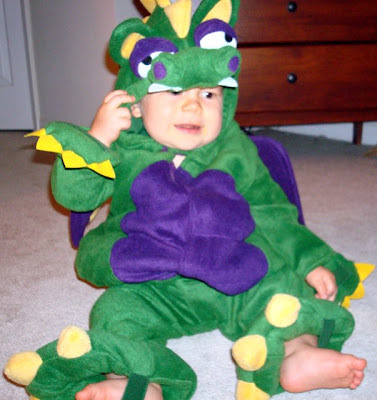 I wanted to find a costume like that for my son. I coudn't so I tried to make one. Didn't look anything like that so he decided to wear the one from last year. Oh well.